He was a thrilling subject (most of the time) for the photographers who shot him. 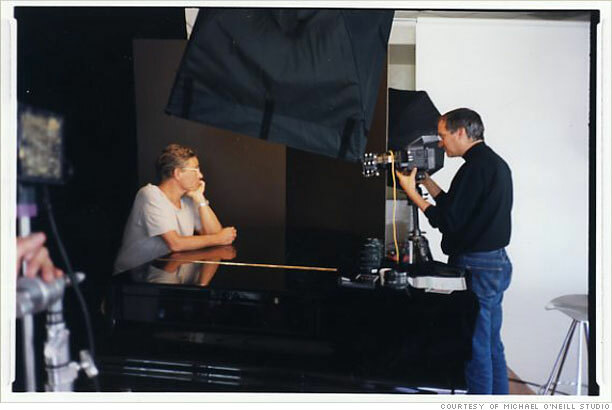 Now, Fortune talks to Norman Seeff, Michael O'Neill and Albert Watson about what the process was really like. Jobs, perhaps more than most executives, appreciated the importance of strong images to accompany those stories and articles, and he allowed himself to be photographed in creative, dramatic and sometimes humorous ways. The result: A collection of iconographic photos that often captured (and helped promote) Jobs' humanities-meets-technology ethos. He was a thrilling subject (most of the time) for the photographers who shot him, partly because of his deep interest in the visual arts. He also idolized Edwin Land, the co-founder of the Polaroid Corporation. "Jobs was absolutely aware of everything on set," recalls Michael O'Neill, who photographed Jobs many times; he shot Jobs with singer Sheryl Crow for a Fortune cover story on the introduction of the iTunes Music Store. "He was in control of what he was putting out to the camera and the world." Albert Watson shot Jobs in 2006 for Fortune's feature on the 25 Most Powerful People in Business. The portrait graces the cover of Walter Isaacson's new biography, and Apple used the picture on its home page after Jobs' death. He remembers Jobs as being incredibly charismatic, a bit like Clint Eastwood. Norman Seeff, who photographed Jobs in lotus position with a Macintosh computer on his lap, spoke of Jobs' intensity and determination, a quality Seeff says he also saw when he photographed musical greats Ray Charles and Tina Turner -- and Sir Francis Crick, one of the discoverers (with James Watson) of the structure of the DNA molecule. "Those people have I what I call 'far vision'. They look out to the future. The dreamer always has a vision of the possibilities in the future," Seeff says. "That was my sense of Steve." Above: Jobs turning the camera on photographer Michael O'Neill. A 112-page collection of Fortune stories about him from the past three decades.